The best time to nurture socioemotional or noncognitive skills is during a child’s early development. Photo: ADB. The Philippines has raised the education levels of its workforce over the years, but the skills mismatch in the country is still high. A new study from the World Bank says many employers in the Philippines look for not only technical skills, but also a good work ethic, commitment, and personal and communication skills in their employees. It recommends improving the development of socioemotional skills—also called noncognitive, behavioral, or soft skills—in schools and in technical and vocational training. This is based on the presentation of World Bank’s Gabriel Demombynes at the 7th ADB International Skills Forum in Manila in December 2017. In the 1950s, more than half of the Philippines’ adult population had no formal education. Today 35% of the labor force has received primary education, 40% has secondary education, and 20%, tertiary education. However, a study by the World Bank shows the number of Philippine firms reporting inadequate job skills rose by 30% in the past 6 years. Two out of three employers reported difficulty finding people with socioemotional skills, which are crucial in today’s workplace. These skills are especially valued by expanding, innovative, and larger companies. Source: Slide presentation of Gabriel Demombynes at the 7th ADB International Skills Forum. The study titled Developing Socioemotional Skills for the Philippines’ Labor Market says Filipinos with soft skills are more likely to complete secondary school and pursue university studies. They are also more likely to find jobs and receive higher wages, equivalent to a 9% bump in salary. 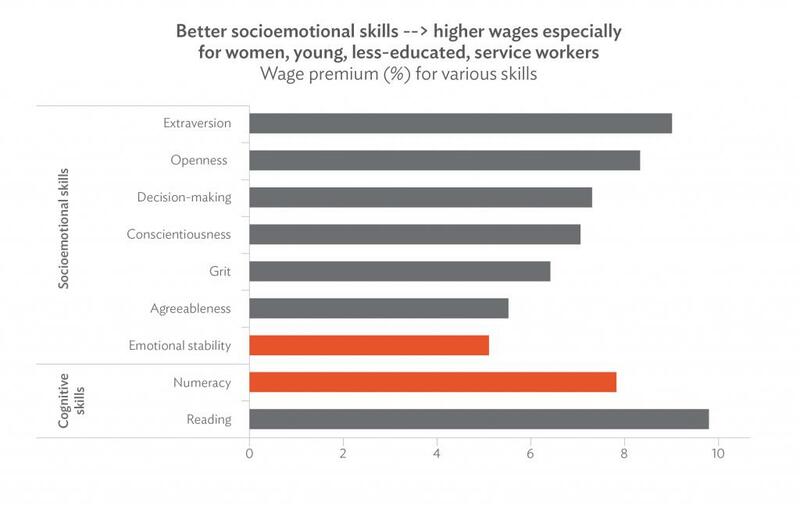 The study notes in particular that women, young workers, less-educated workers, and those working in the service sector who have better socioemotional skills get a wage premium, while more-educated and employed workers tend to score higher on measures of grit, decision making, agreeableness, and extraversion. With the education sector not being able to meet the high demand for socioemotional skills, the number of firms that provide training to their workers has doubled over the past 6 years. In the past year, 60% of Philippine firms provided employee training, well above the average in Southeast Asia. More firms train their workers in socioemotional skills than in technical skills, underscoring the country's growing socioemotional skills gap, the study says. While it is well-established that socioemotional skills are important for lifelong learning, there is very little research on what can actually be done. Socioemotional programs that are linked to vocational counseling for first-time workers may be effective. However, the most promising area is in improving teacher training by helping teachers to understand the importance of socioemotional skills and to develop them in their students. 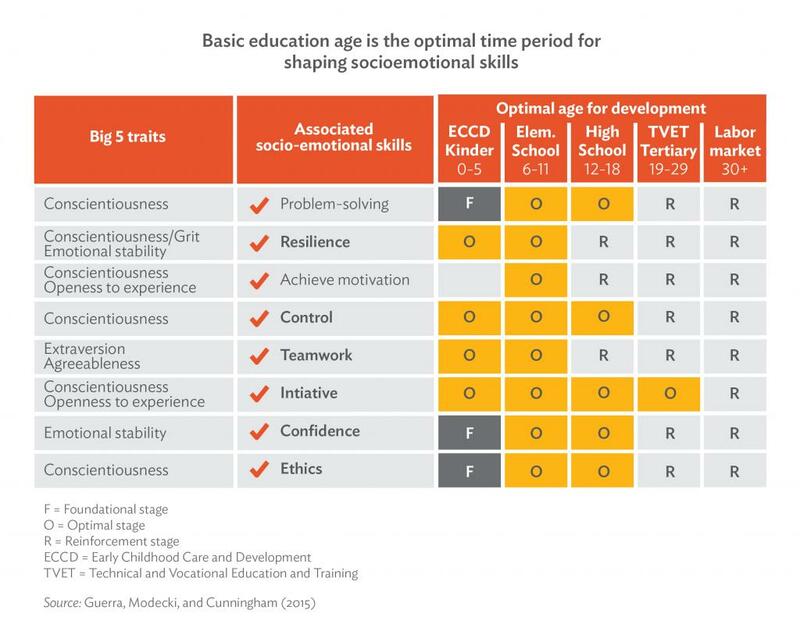 The World Bank study says the best time to foster behavioral skills is during a child’s early development through Grade 12. Training programs should include socioemotional skills development and target young workers. Reactivate earlier efforts toward a common early childhood education and development approach by integrating actions by different agencies toward a common goal (setting up the foundational stages for cognitive and socioemotional development). Embed socioemotional skills in the curricula of the extended compulsory education from kindergarten to grade 12 or senior high school by stating objectives and targets and by preparing the teachers for effective delivery of content. Mainstream socioemotional skills in regular training programs (for example, in government’s online youth employment program JobStart, or in technical vocational trainings) after assessing delivery performance and impact. Invest in monitoring and evaluation tools, like talent mapping, regular surveys, and participation in international skills assessment efforts, to inform policymaking. P. A. Acosta et al. 2017. Developing Socioemotional Skills for the Philippines’ Labor Market. Washington, D.C.: World Bank Group. World Bank. 2017. Philippines: Keeping in Step with What Employers Want. Blog.